Numerous Syrian Muslims who fled their war-torn country and found refuge in Lebanon have converted to Christianity despite threats and incidents of attacks on new converts, according to a report. Photo: REUTERS/Ali Hashisho. 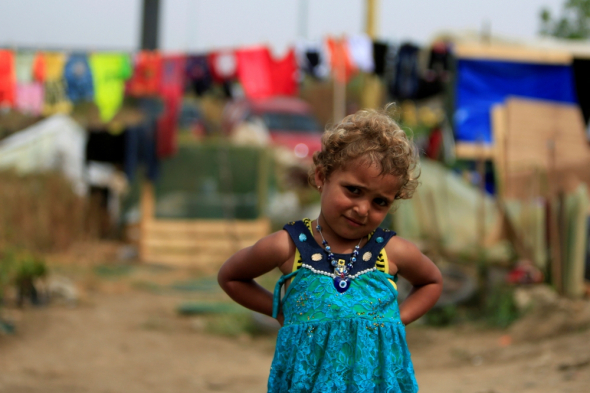 A Syrian refugee girl poses outside tents during the visit of Dutch Prime Minister Mark Rutte to the refugee camp in Zahrani village, southern Lebanon May 3, 2016. Bishop Saliba said the church accepts converts only after confirming that their faith is genuine. Muslim refugees are turning to Jesus despite it being extremely risky. Radwan was once stabbed while he was coming home from the church. The attackers were Syrians from his own tribe. His wife still wears a hijab outside of church for her safety. “When I see a person wishes to be Christian, I don’t stop him, but we try to test him,” the pastor was quoted as saying. The Constitution of Lebanon provides for religious freedom. However, thousands are coming to Christ across the Middle East, Voice Of the Martyrs Canada, which runs radio shows in the region, said in January. Muslim refugees in Europe have also converted to Christianity. More churches in Germany reported this growing phenomena in December 2016, with The Independent noting that Muslims, especially Iranians, are seeing Christianity as a new chance at freedom. Last year, the founder and CEO of SAT-7, a Christian satellite network that reaches out to refugees fleeing war-torn Syria and Iraq, said many Muslim families are turning to Christianity, where they encounter a message of peace and love.